Oreo Cookie Cross Favors are a must have for your Christening or Baptism Party! 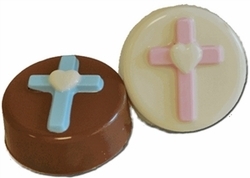 These delicious hand dipped and hand decorated chocolate covered Cross Oreo's one of our most popular Christening and Baptism Favors! Our delicious Oreo's are dipped in milk chocolate or white chocolate to make them extra yummy! Complete with a beautiful Edible Chocolate Cross in the middle, your guests will love these tasty treats!